The Notgrass Company Exploring Government curriculum is a one-semester (half-credit) high school course that covers the government of the United States from its beginning to the present with a special emphasis on the Biblical pattern for government and the U.S. Constitution. Students will learn about federal, state, and local government and become better equipped to understand our country's government as they learn about contemporary issues facing our nation today. 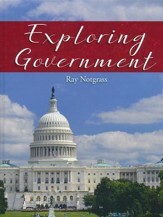 The Exploring Government textbook includes 75 lessons. At the beginning of each unit, an introduction, list of books used in the unit, project literature assignments, and any additional assignments are laid out; these overarching assignments are broken up into daily tasks given at the end of each day's reading. We Hold These Truths contains the historic documents, essays, speeches, and other works related to the text. Entries include "On the Divine Right of Kings," the Magna Carta, the Declaration of Independence, Wesberry v. Sanders (1964), the Tonkin Gulf Resolution, a Letter from an Anonymous Veteran, and more. This 2016 updated edition includes major revisions and updates to the text, including a new layout with hundreds of color photos and illustrations, a new optional English/literature half-year credit, hands-on project and writing ideas for every unit, and a completely revised Student Review Pack (sold-separately) designed for ease-of-use. 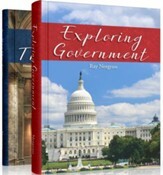 Please Note: the full Exploring Government program also includes the following components, which are not-included and are sold-separately: Exploring Government Student Review Pack (which is an optional supplement with review questions, a quiz & exam book, and an answer key) plus four highly-recommended works of literature: Mornings on Horseback by David McCullough, The Autobiography of Calvin Coolidge, Born Again by Charles W. Colson, and God and Ronald Reagan by Paul Kengor. 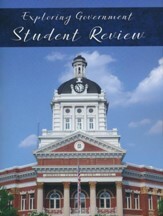 This Notgrass Company Exploring Government Student Review Pack is a set of optional resources designed to be used with the Exploring Government Curriculum Kit (not-included and sold-separately), which contains the textbook and primary document reader. The Student Review with review questions for each lesson and literary analysis of the books assigned in text. The Quiz and Exam Book with quiz for each unit and an exam every five units (15 quizzes and 3 exams in all). The Answer Key with all the answers needed for the course. Line-listed answers arranged by unit and lesson. 27 pages, softcover. This Exploring Government textbook includes 75 lessons. At the beginning of each unit, an introduction, list of books used in the unit, project literature assignments, and any additional assignments are laid out; these overarching assignments are broken up into daily tasks given at the end of each day's reading. NASB Scripture used. 455 pages, hardcover. This item does NOT include the We Hold These Truths text. 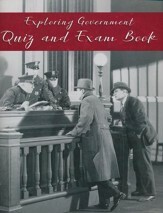 This quiz and exam book is part of the Notgrass Company Exploring Government 2016 updated edition curriculum (other components not included). This Quiz and Exam Book with quiz for each unit and an exam every five units for a total of 15 quizzes and 3 exams. This book is already included in the (sold-separately) Student Review Pack and is ideal for co-ops or families with multiple students. 2016 updated edition. This answer key is part of the Notgrass Company Exploring Government 2016 updated edition curriculum (other components not included). 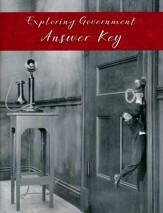 This answer key contains all the answers needed for the course, including the lesson review answers (questions given in the sold-separately textbook), literary analysis answers (questions given in the sold-separately student review pack book), and quiz and exam answers (for the quiz and exams in the sold-separately student review pack). Line-listed answers are arranged by unit and lesson. 27 pages, softcover. 2016 Updated Edition. This student review is part of the Notgrass History "Exploring Government" Curriculum and contains review questions for each lesson and literary analysis of the books assigned in the text. Students will have to write out their questions on separate notebook paper. 39 pages, softcover. Non-reproducible.